Hearing voices, seeing visions, words that leap off the pages of the Bible. Does God really speak in such real, tangible ways? Nudges, feelings in your heart, the sense of something larger. Are these from God or just tricks our mind plays? Are those who claim to hear from God a bit crazy or is God truly speaking? How can you know if God is speaking to you? We’ve all heard stories after some horrific act of violence that the person claimed to have heard God telling them to do this awful thing. Yet God wouldn’t actually tell us to murder our children or commit other acts of violence, would he? How do we know if the voices and urges are from God or from the enemy or our own thoughts? I can tell you from my own experience that God does communicate with us still today. He uses a variety of techniques to move in us and speak into our hearts. I’ve heard an audible voice. A friend sees words as if written on a whiteboard. Another friend experiences ‘neon Bible verses’- words that seem to leap off the page in flashing lights. Others feel an overwhelming sensation of warmth and comfort. Some have messages and images brought to mind. You may experience one or more of these methods – or something else entirely. Or, you may not have noticed God’s voice in your life yet. When you do begin to hear God speaking into your heart, you need to check that it is indeed God’s voice and not your own (or the enemy). These five questions will help you confirm God’s voice and know if God is speaking to you. 1) Is it in line with Scripture? God will NEVER ask you to do anything that’s not in line with his Word. Make sure Scripture supports where God is leading you. God will often speak through the words in the Bible, so keep reading and notice if you receive confirmations through the Scriptures you’re reading. Don’t try to cherry-pick verses just to support what you’re hearing, though. Choosing verses out of context, just to support your case, is an indication your direction may be of your own making (or from the enemy). 2) Is your heart open to God’s answer? Have you fully opened your heart to God’s way? Are you ready for whatever direction he leads? Or, are you still trying to provide the answers and details? Check your heart and make sure you’re fully surrendered to God’s will, not your own. 3) Is it confirmed through Godly counsel and other people? God doesn’t just speak to you. He will use others around you to confirm his will. Are you hearing confirmations from others in your life? Seek out Godly counsel. Find someone in your life who models strong faith and speaks wise words. This may be a friend at church, a pastor or ministry leader, or even a counselor or spiritual director. If what God’s speaking to you is significant or you’re really not sure about saying yes, then seek out additional counsel and support. Share your story and together work to discern what God is truly asking of you. 4) Is it confirmed through other circumstances in your life? God isn’t random. He doesn’t drop unrelated commands into our hearts. He is the Great Conductor, the One who sees our lives from beginning to end, the One who has bigger and wider ways than we can imagine. If God’s asking you to do something, placing a new dream on your heart, he’ll be at work in your life to enable that plan. Look for where he’s opening doors and closing others. Be aware of who he’s bringing into your life and what experiences he’s leading you toward. Watch for clues and confirmations in your life – both through your life story and in your current circumstances. 5) Will it require you to trust God? God doesn’t call us to what’s comfortable. Instead, he calls us beyond our own capabilities where we must trust him to equip us. God calls us to places where his glory can shine through our obedience and our full surrender to his power. God’s whispers will be bigger than your own. They will require more than your own dreams and abilities. His plans will feel too much, too scary, too risky. You’ll have to trust him and lean into his power to take the next step. Are you Following God’s Lead? You may not need all five of these checks to know if God is speaking to you, whispering into your heart. Sometimes he asks small things – go pray with that person, serve in this place, say you’re sorry. Other times, though, his asks are much larger and require a deeper level of discernment. Everything he says, though, both large and small, can be confirmed with these five checks. Will you listen for God’s voice in your life? Will you take notice of the ways his still, small voice speaks to you? Will you be discerning to know if God is speaking to you, or if it’s your own ambitions and dreams? Then, will you bravely and boldly say yes to trust where God leads? Ready to Learn to Trust God? Join the FREE 4-Week Study! Learning to trust God with your life is no easy feat. Yet, it may be the best thing you can do for your life. If you’re struggling to trust God in the storms of your life, not sure God can really help with your troubles or don’t know where to even begin, I invite you to join the Trusting God study. Trusting God is a free 4-week email-based devotional to help you learn to trust God through the storms of your life. Through these 4 weeks, you’ll learn to trust God and discover his peace and strength through the storms in your life. Click here to learn more about the Trusting God study! 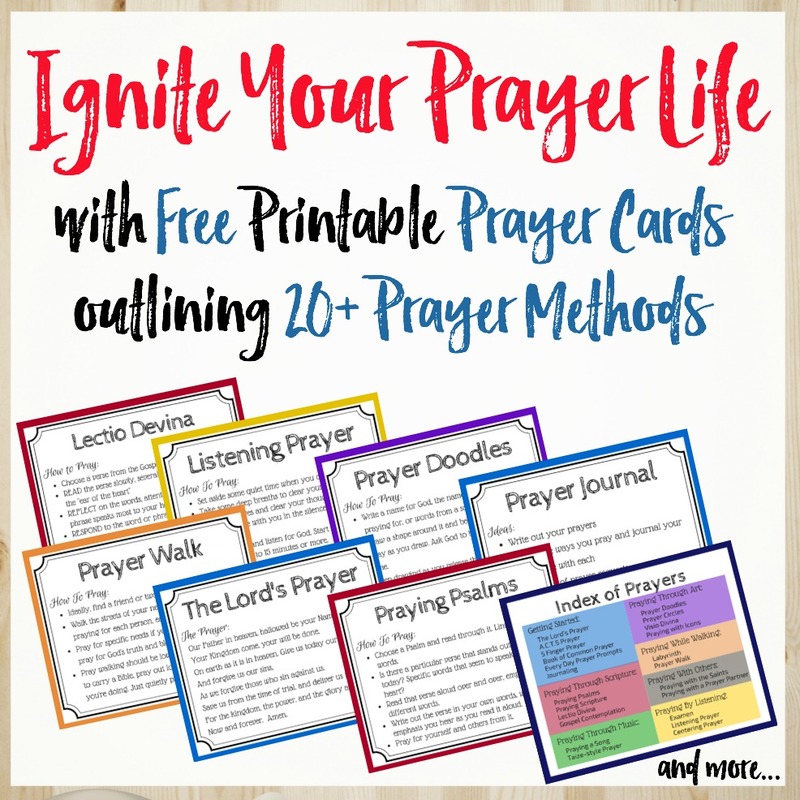 Thank you for these inspirational ways of getting closer to God! I want to learn how to pray when I’m in a group! I get tongue tied! Thank you for the ideas I have read!